How's the international break been for you? Still not enjoying it? Me neither and coming towards the weekend, I'm preparing myself for two days of torture. Today I will be mostly praying for the God of injuries not to strike down Robin van Persie, Tomas Rosicky, Samir Nasri, Gael Clichy and Bacary Sagna who could all play for their countries tonight. It's arguably the most worrying time to be an Arsenal fan. We've got nine important games left and we need as many of our squad fit as possible if we're going to have a chance of winning the league. Congratulations must go to Aaron Ramsey who has been appointed Wales captain for the England game on Saturday. I'm sure it will be a great honour for him to lead the side out. There was some positive news emerging from Copenhagen where Nicklas Bendtner resumed light training yesterday after taking a fall and injuring his ankle on Wednesday. Denmark hope he'll be fit for tomorrow's game with Norway. And talking of Bendtner, it appears yet another club has been linked with his services come the summer, this time it's Sunderland. Obviously there has been a lot of smoke surrounding the big Dane because of the comments he made about reevaluating his future at the end of the season, but as I've said before I hope he stays. 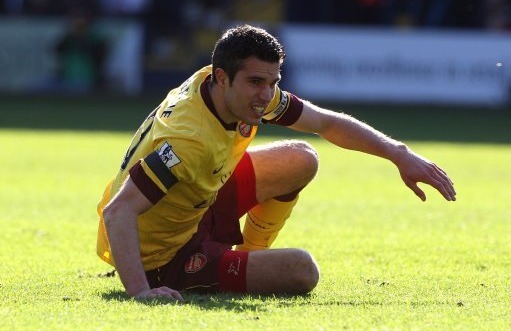 Another striker making the news is Robin van Persie. He's been talking quite frankly about Arsenal's season so far and said we've not been good enough to win a trophy. "We always do our best and of course we always want to win. On a number of times we were very close, but at the last moment it's often not good enough and that's the reality. "It's very frustrating when you lose, especially when we're so close, but we have to look forward and now it's up to us to change all that. "I firmly believe in the team, Arsenal and myself, and I'm positive we will win prizes." He goes on to talk about the unsporting behaviour of Chelsea and Barcelona, which is interesting to hear him say. We could all see what was going on at the Camp Nou on our TV screens but to have van Persie tell it first hand is interesting. The striker also reveals he's in talks with the club to extend his contract, which has three years left to run. I like van Persie's honest assessment of our season so far and his commitment to the club. I know we've stuck by him during the times he's been out of the game injured, but he could have quite easily walked away from us. He is a true Arsenal man. He loves the club and is honoured to play for us. And in a modern game were loyalty is dependent on a huge way packet, and sometimes not even money can buy a player's commitment, it is refreshing van Persie loves Arsenal as much as we all do. It appears that England under-21 coach Stuart Pearce is determined to take Jack Wilshere to the European Championships in Denmark this summer. I really hope someone sees sense in this affair. Wilshere has played 40 times for Arsenal this season. He's played Champions League football and for the full international side. Why does he need to play more football in the summer? Answer... he doesn't. It's just crazy and you can understand why Arsene Wenger gets so upset with the way his players are treated by their national associations. Elsewhere, Bacary Sagna talks about the poor refereeing of tackling in the Premier League. And the Premier League could consider kicking off the final three league games of the season at the same time, an Arsene Wenger idea, if all club are in agreement. Rubbish transfer story of the day goes to The Sun, as they link us with a move for Roma central defender Phillippe Mexes who is out of contract at the end of the season. Finally, congratulations must go to Luke Freeman who has signed a new deal with the club.